Several million years of evolutionary history have shaped the shola forest complex in the Western Ghats into a unique mountaintop habitat; isolated, but replete with species found nowhere else on earth. We take a closer look at this ancient landscape and its delightful residents— the short wings and the pipits— among several others. I stalked like a cat through the undergrowth, stopping, watching, moving one light footstep at a time. I kept losing sight of my quarry, but I knew I was heading it in the right direction. Over the slow constant rain in the thick evergreen forest, I could hear the bird shuffle amongst the leaves. As I saw the net, I rushed, I flushed and I caught! Holding a bird that you’ve been waiting a lifetime to see is pretty special if you are a birder. To top that, I was holding a Rufous-bellied shortwing (Bradypteryx major) [now Nilgiri blue robin (Myiomela major)], a truly exceptional bird. Its evolutionary origins and genetic associations with other birds are still poorly understood. What is clearly known, though, is its intimate link with its habitat, the sky-island forests of the Western Ghats in India. I was sampling a dank and misty forest patch at 2200m, where the ground wriggled with leeches, on a project on bird population biology, and I was loving every moment of it. Sky islands are montane habitats, restricted to mountain-tops starkly different from surrounding environments. So, in many ways, they are like islands in the sky. Out of the 27 such systems spread around the world, the Western Ghats sky islands are the most isolated. This linear archipelago of shola forests spreads across 6 degrees of latitude along the jagged mountains. The mountain range is not continuous, though, having two gaps (Palaghat and shenkottah) where the valleys plunge to sea level, 2500m-high mountains on either side. Each sky island is a mosaic of grasslands and stunted rainforests. The patches of forests dispersed among grasslands add another level of isolation or “nestedness” especially for less vagile creatures like amphibians. A world biodiversity hotspot, it’s not only exceptionally diverse, it also has some of the highest levels of endemism known. Throw in a few million people trying to eke out a living and you have a place in dire need of research and conservation. 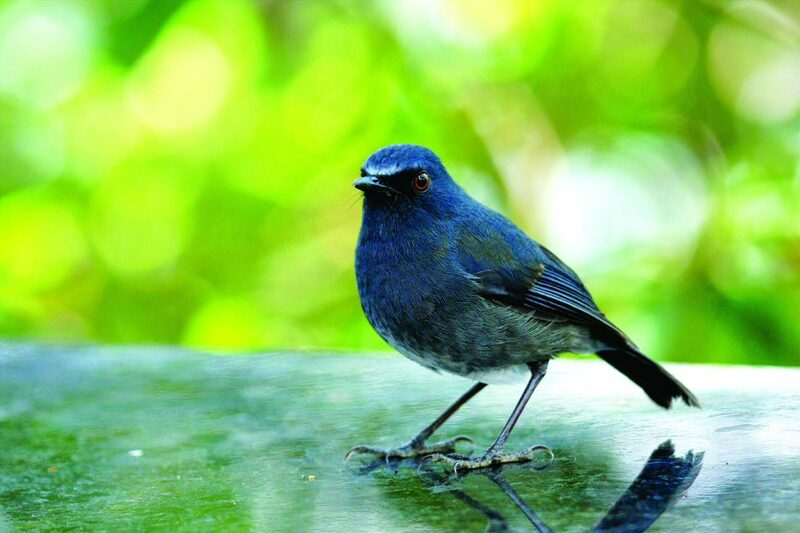 My pulse raced as I held the first rufous-bellied shortwing or Nilgiri blue robin, thinking about the information this work would provide. “if we can prove it’s a new genus, we’ll call it shola-bird,” said Dr. Robin Vijayan, who coincidentally shares his name with a bird he has studied for a decade now. Sholas are so remote that Robin had to begin his research with the first detailed survey of the robin. Two sub-species were known but not much more. There was hardly any information on the numbers and whereabouts for this and many other endemic shola species. Robin’s work showed that these birds don’t really like to fly across habitat gaps and stick to their own patches, and so he further expected that genetic relatedness among shortwing populations vary as a function of geographical distance; that is, relatedness of populations decreases with increase in physical distance. Instead, he found that the Palaghat “gap” has played a bigger role in the evolutionary history of this species. This small gap between two mountains has prohibited shortwing populations from mixing for the last 3 million years, giving rise to two species on either side. This has also raised serious doubts regarding the level of population differentiation within many other endemic avifaunal species of the sholas, which are currently considered a single species. The Black-chinned Laughingthrush (Garrulax cachinnans), although common wherever found, has a very small and severely fragmented range, and is thus considered to be an Endangered bird. Paleo-palynological (ancient pollen) records suggest that ice-age cycles and ensuing climate change have strongly influenced the forest-grassland matrix of the sholas, with wet periods promoting forest spread and dry spells stimulating grasslands. Amazingly, the effects of these fluxes have been etched into the shortwing DNA, affecting population connectivity. In fact, the last dry period and the contraction of shola forests it caused, perfectly coincides with a bottleneck seen in shortwing populations. “Run! Run towards the net!” Shouted loganathan. As Pandi ran in what looked like a “slow-mo” sequence due to the knee-deep muck, we burst out laughing. Seconds later, five Nilgiri pipits (Anthus nilghiriensis) flew straight into the mist-net, which made us jump up and do the same “slo-mo” run towards the nets. Next came the wobbly task of sitting on the jello-like ground, while the two assistants with umbrellas huddled over me and the equipment as I took measurements and extracted samples that evening. The Nilgiri Pipit is a shola grassland endemic. These rich brown and heavily-streaked birds occur in the large swathes of short grassland that separate shola forests. Their habitat makes catching them tricky in these windy places, where setting up mist-nets is difficult, and trapping a bird that can presumably see the huge net, a little more so. Because they live in these montane meadows year round, robin hypothesises that the pipit’s DNA should tell a story opposite to the short wings. Through this project, he expects to see an expansion in past pipit populations coinciding with bottlenecks in the short wings. If true, then for hundreds of millennia, pipits and shortwings have been unwittingly caught in repeated cycles where shola supremacy of one means a downfall for the other. 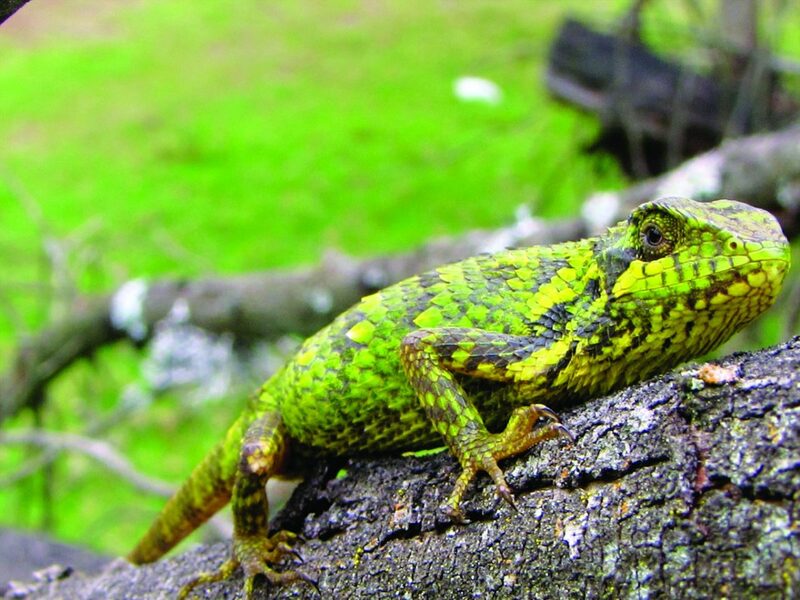 Not just the birds, but several species of reptiles, like the Spiny lizard (Salea sp., below) and Cross backed bush frog (Raorchestes signatus, right) are also endemic to the sky-island forests of the southern Western Ghats. “it’s so common that it’s a little annoying,” complained Chetana about the Nilgiri laughingthrush, as she tried to record calls of a flycatcher while a gang of laughingthrushes cackled in the cacophony. She was talking about one of the most range-restricted continental species of birds. Birdlife international designates any species with a known breeding range of fewer than 50,000 km2 within this category. 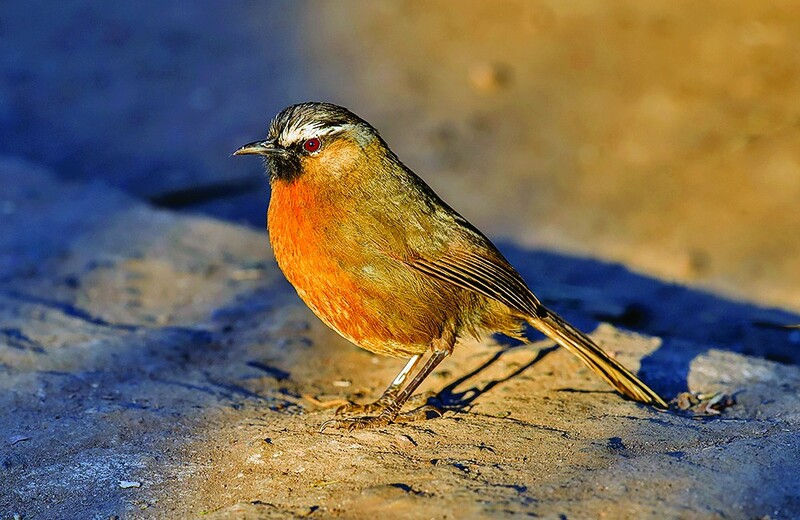 The black-chinned laughingthrush of the Nilgiris “sky island”, although common wherever it does occur, has a global range of about 250 km2. That’s about a square block, 15 miles on a side, in the whole world! It doesn’t stop there; apart from the laughingthrush, the shortwing and the pipit, the sky-islands have two endemic flycatchers, another laughingthrush, a thrush, a pigeon, and a grassbird (warbler), with varying but similarly minuscule range sizes, found nowhere else in the world. Amazingly enough, this set of endemics occurs repeatedly, and are common on, every sky-island, proving their incredible specialisation for these habitats. In addition, about 290 other birds are seen there, including a large number of winter migrants. Another fascinating thing about shola endemics is that their closest living kin is mostly Himalayan. This Himalayan affinity doesn’t stop at birds. There are many trees (like the Nilgiri rhododendron), orchids, a mountain goat, a marten, many snakes, frogs and lizards all having close cousins in the Himalayas. Although their relationships are known, we know very little about how and when these species or their ancestors got to the Western Ghats. However, the DNA of many of these birds is now being sequenced for the first time and their histories explored. There’s a Gaur in my Tea! As I sat one evening chatting to a tea-estate manager, he talked excitedly about the animals that visit his estate. We took a walk through his tea garden at night and almost bumped into an enormous Gaur (a species of wild cattle, males reaching six feet at the shoulder) grazing peacefully on the grass growing among the tea bushes. Archaeological evidence suggests that humans have lived in shola landscapes for the past 40,000 years. Till recently, this included tribes that subsisted by raising and grazing cattle in the shola grasslands. However, at the turn of the 19th century, the British realised that these slopes were perfect for growing tea, coffee and spices. This resulted in rapid expansion of tea and spice estates and the devastation of the fragile sholas, especially the grasslands which were considered wastelands. Later the grasslands that had not been planted with tea or coffee were converted to plantations of exotic eucalyptus and acacia to provide fuel for the swiftly growing human populations. Scores of forest fragments have also been lost or heavily degraded; however, many still persist in swathes of tea and wattle, primarily because they provide fuel-wood for local people. In all, 50% of shola habitats have already been lost and the remaining reel under immense anthropogenic pressure. 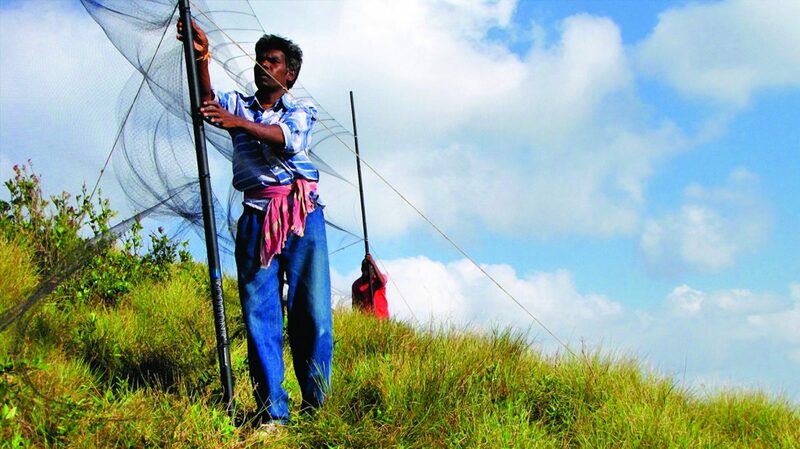 A member of Dr Robin’s research team sets up a mist net, which is used to catch the birds without harming them. This being said, some remaining intact stretches of sholas have now been put aside as wildlife sanctuaries. Tea and coffee estates are willing to conserve shola forest fragments within their properties and plant indigenous shade trees. Animal populations are recovering. In fact, gaur populations have bounced back so dramatically in some areas that they are now entering fields and destroying crops. The many-layered spatiotemporal separation of shola habitats is beginning to emerge as a natural experiment to study the effect of habitat fragmentation on organisms. Robin’s genetic investigations on shola birds will tell us how birds react to repeated cycles of fragmentation and amalgamation of forests and grasslands through wet and dry climate cycles. His work should also uncover the effects of human-induced changes in these landscapes on the population ecology of these threatened birds, by studying the present connectivity between sky-islands. As the brown Wood owl hoots to welcome the night and giant flying squirrels start gliding through the trees, a shortwing sings one last time to advertise its territory. To me, the sholas of the Western Ghats invoke a feeling of being in an incredibly ancient landscape; the constant state of flux influencing its past, present and future destinies and giving the environment a unique flavor unlike anywhere else. Sahas works at Hastings Natural History Reserve. He is interested in the biogeography, community ecology and evolutionary biology of avians and reptiles. Loved reading this ! . Never knew about these . Lovely !